I met a local fisherman by the name of Tatay Lucio who was willing to take me out fishing with him. I paid for the gas, which was 200 pesos and that lasted us all morning. 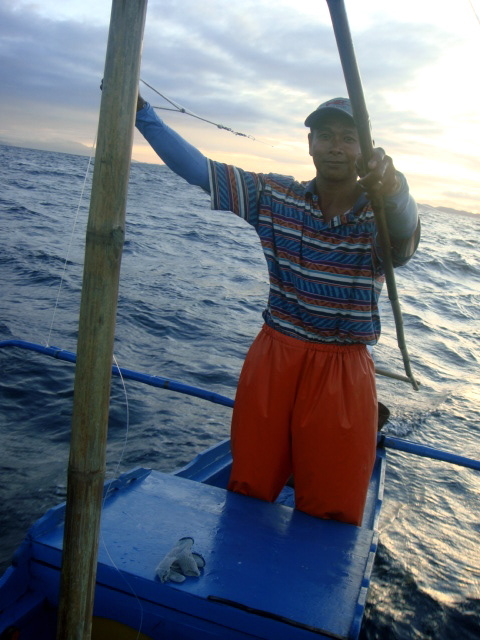 Lucio uses a long hand line to catch tuna, mackerel and any other fish partolling the ocean. He knows how to troll lures and so after showing me how he fishes, we trolled my rapala. 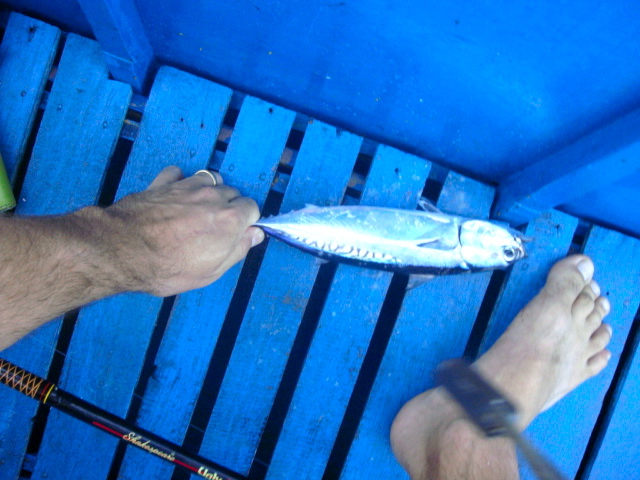 We did not have much luck that day, only catching a small tulingan. If you happen to be visiting Tamaraw Beach in Puerto Galera, Mindoro, and are looking to do some fishing you can contact Tatay Lucio via his daughter Haide’s cell at: 09994118923 Tell him you heard about him from Ben the ‘Cano, who fished with him. He does not speak that much English but does understand a lot. I learned that he also builds and sells Banka Boats, so if you live in Puerto and are looking for someone to build or sell you a boat you can contact him. He most often goes tuna (yellowfish, bonito, skip-jack) fishing with his long line (300 meters, 35 hooks) and he told me the most he caught on his long line at one time was 10. He also has a could home made lures and a rapala which he trolls for Wahoo Tangigue. The largest fish he has caught he said weighed 30 kilos 🙂 When conditions are right he goes fishing for mackerel tulingan like the one we caught with a smaller line and hooks. Posted on January 6, 2012, in Boatmen. Bookmark the permalink. 2 Comments. what is the best time of year to catch Wahoo??? Dan, They can be caught all year long, however summer (March to June) seems to be the best time of year to catch them.